The Bhagavad-gita teaches that we cannot avoid old age, disease, or death. When Srila Prabhupada brought Krishna consciousness to America in 1965, his young disciples accepted the truth of this teaching. And as time has passed and devotees have aged, this teaching has become more relevant. Gurudas, one of Prabhupada's earliest disciples, has spent his life in Krishna's service. He helped establish the London temple, traveled the world distributing books and spreading Krishna consciousness, and recently started the Vedic Care Charitable Trust to help aging devotees in their final years. Although the Vedic Care Charitable Trust (VCC) has only existed since 2015, it has already done a lot of good. One example involves a woman in Belgium named Manisha, who was uninitiated because she could not stop smoking. This did not deter her from devotional service, however. She chanted daily, distributed prasadam every Wednesday, and hosted a biweekly kirtana program at her home. In 2016 Manisha was diagnosed with bladder cancer, and after an operation, she received chemotherapy. After three treatments, she decided to stop the chemotherapy, since it was making her too sick. She knew that this would mean the cancer would kill her, but at age seventy-eight, she was ready for that. With financial support and guidance from the Vedic Care Charitable Trust, her friend Bhagavati Devi Dasi was able to help her quit smoking so that she could live out her time with the devotees at Radhadesh, the ISKCON community in the Belgian Ardennes. 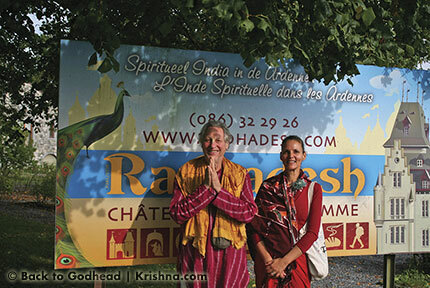 Through Krishna's mercy, Manisha was able to sell her home in Liege and move to a home near the temple. Inspired by this mercy, Bhagavati wrote to her spiritual master, Kadamba Kanana Swami, and asked him to initiate Manisha. Since she was now following all four of the regulative principles and chanting sixteen rounds, he was very happy to do so. With special permission from the local temple authorities and ISKCON's governing body commissioner (GBC) for Belgium, Manisha was initiated. After her initiation, she did well for some weeks, but then things started to go downhill very fast. She had developed metastasized bone cancer and was in a lot of pain. For the last two weeks of her life, she could no longer leave her bed. After a few days, Bhagavati called in the local palliative care team and requested a home nurse for Manisha. Recognizing that spiritual care was more important than physical care, Manisha's friend turned her room into a spiritual place with an altar opposite her bed. Pictures of Krishna adorned the walls, and Bhagavati's shalagrama-shila (Krishna's incarnation as a deity in the form of a small stone) moved into her room. When Manisha was introduced to Him, it was explained that at the end she would be able to hold Him in her right hand. A recording of Srila Prabhupada chanting japa played most of the time except for when she was listening to the Bhagavad-gita or the Chaitanya-charitamrita. On Lord Balarama's appearance day, Bhagavati purified Manisha's right hand with a few drops of water, put a flower in it, and asked for her prayer to Balarama. She asked Him to take her as soon as possible. Manisha was very sleepy, and I just sat next to her bed to read to her. The doctor came again at 2:00 p.m. and told us that she would have another twenty-four to thirty-six hours. By 3:00 p.m. I was sitting with Manisha together with another devotee and her breathing changed into the labored "death rattle." I knew she would probably not have twenty-four hours, so I called my spiritual master, who happened to be at Radhadesh. He came half an hour later and started chanting for her. There were many devotees in the room with her. Her family was sitting at her left side, and I was sitting at her right side, armed with tulasi leaves and Ganges water. I had put my shalagrama-shila in her right hand, and she was holding on to Him tightly. We could regularly see her lips move when she was trying to chant with the kirtana. At 4:40 p.m. she opened her eyes and started staring with huge eyes. 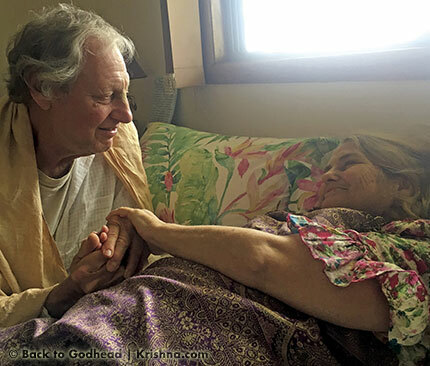 At 4:45 she smiled, chanted Hare Krishna, and stopped breathing for a long time. I quickly administered the tulasi leaves and Ganges water. She breathed one more time and left while her spiritual master was chanting and I was also chanting the mantra in her right ear very loudly. In the Bhagavad-gita (18.66), Krishna says, "Abandon all varieties of religion and just surrender unto Me. I shall deliver you from all sinful reaction. Do not fear." In line with this teaching, Kadamba Kanana Swami stated that since Manisha had given up everything she had in Liege to move and leave her body in Radhadesh, Krishna reciprocated. This act of surrender was her ticket back home to Godhead. This story illustrates the crucially important work being performed by the Vedic Care Charitable Trust. Gurudas formed the Vedic Care Charitable Trust with the help of Aradhana Devi Dasi, Rama Nrisimha Dasa, and Yadunandana Pada Dasa, who soon moved on to other pursuits. In a recent interview, Gurudas explained the need for this work: "I saw the need to take care of our devotees. For fifty years we have evolved, building new temples and communities and farms, publishing new books, starting cow protection programs, but no devotee care. Many devotees who served for years were sent out of the ashram or temple because there was no care facility. My idea is preventative medicine via outreach teams that can assist the families in homes or hospitals and bring the holy names and healthy prasadam to those devotees." Laying out the general idea, Gurudas explained that the VCC is an international member-supported organization meant to create retirement homes offering kirtana, krishna-katha (spiritual discussions), classes, seminars, consulting, and counseling. It also promotes self-subsistent farms and other creative projects. "Our retirement homes allow residents to spend their later years in like-minded association," Gurudas said, "instead of being cared for in isolation and having to react alone to the symptoms of sickness. Staffed hospice facilities and Vedic transition support will be available through this international cooperative based on love and trust. With a focus on preventative care, we can ease the pain and suffering together." The Vedic Care Charitable Trust was registered as a charity in June 2015. Aradhana Devi Dasi, cofounder, trustee, and CEO, says, "We're a platform for connecting everyone who is caring in an isolated way." In other words, there are devotees who are independently trying to do what they can to help but many times lack the know-how and resources. The VCC brings those individuals together under a single umbrella and offers those resources. "Most devotees come to us when in desperate need," she continues, "having nowhere else to go, and although we have many other caring-oriented projects, hands-on devotee care is our main focus. Being neither a religious nor a medical charity, we have the advantage of acquiring financial supporters from many other already established nonprofit organizations, from government grants, and from disparate individuals. By doing our service in an inclusive way, we'll be extending our preaching power into mainstream yogic lifestyles and advancing Krishna consciousness. This holistic service is very needed in our Vaishnava communities." In its three-and-a-half-year existence, the charity has cared for about fifty devotees and begun a number of important projects. Individual care is being offered in Vrindavan, India; London, England; Radhadesh, Belgium; Alachua, Florida; and New Talavan, Mississippi. In addition, planning for a model facility is underway in Sedona, Arizona. This facility will demonstrate how devotees will be cared for in a Krishna conscious environment, where people follow the regulative principles, discuss the Lord's glorious pastimes, and chant His holy name. In this way the aging devotee, through association with other devotees, will be able to peacefully transition back home to Godhead. One of the premises inspiring the Vedic Care Charitable Trust is that the Krishna conscious way of life greatly benefits the spirit soul and also makes material life better. Consider, for example, three elements of a devotee's life that the VCC offers sick or dying devotees and others: diet, association, and sankirtana. The Bhagavad-gita (3.13) states: "The devotees of the Lord are released from all kinds of sins because they eat food which is offered first for sacrifice. Others, who prepare food for personal sense enjoyment, verily eat only sin." The sick or dying devotee who is fed only krishna-prasadam will enjoy a karma-free diet that aids in the liberation of the soul and benefits the material body. The second aspect of the devotee's life to consider is association. Srimad-Bhagavatam (3.25.25) states: "In the association of pure devotees, discussion of the pastimes and activities of the Supreme Personality of Godhead is very pleasing and satisfying to the ear and the heart. By cultivating such knowledge one gradually becomes advanced on the path of liberation, and thereafter he is freed, and his attraction becomes fixed. Then real devotion and devotional service begin." In the purport to this verse, Srila Prabhupada explains, "One must give up the association of materialistic persons and seek the association of devotees because without the association of devotees one cannot understand the activities of the Lord." When placed into a typical retirement home or hospice, the devotee is surrounded by materialists who speak of everything except Krishna. They may discuss issues of health from a secular standpoint. They may discuss sporting events, the lottery, or wins and losses at a recent trip to the casino. They may discuss the illicit activities of royalty, celebrities, and neighbors. They may blaspheme or use foul language. One will hear every manner of foolishness coming from the lips of these people, but never will one hear the transcendental vibration of Hare Krishna. Surrounded by such people, one might decrease one's chanting or otherwise be harmed in body and spirit. So it is crucial that devotees have the opportunity to associate with other devotees as they prepare to leave this world. The final aspect of the devotee's life to consider is sankirtana, the chanting and hearing of the holy names. The regular chanting and hearing of the transcendental vibration of Hare Krishna, Hare Krishna, Krishna Krishna, Hare Hare/ Hare Rama, Hare Rama, Rama Rama, Hare Hare is the supreme method of attaining Krishna consciousness in this age of Kali. The benefits are legion. For example, Srimad-Bhagavatam (1.1.14) tells us that "Living beings who are entangled in the complicated meshes of birth and death can be freed immediately by even unconsciously chanting the holy name of Krishna, which is feared by fear personified," and in The Nectar of Devotion (Chapter 2), Srila Prabhupada quotes Shukadeva Goswami's advice to King Parikshit: "My dear King, if you want to be fearless in meeting your death next week (for actually everyone is afraid at the point of death), then you must immediately begin the process of hearing and chanting and remembering God." (Bhagavatam 2.1.5) For this reason, sankirtana is perhaps even more important for the elderly. Diet, association, and sankirtana are crucial elements that will allow the elderly to accept aging without lamentation and accept death without fear. They will allow the devotee to live a healthier, happier, and more meaningful life right up to the moment of death. Unfortunately, many elderly devotees, being in traditional care facilities, are being denied these. This is why it is so important that Krishna conscious retirement homes and hospices be constructed. Once they're established, the elderly devotee in need of care will receive nourishing prasadam while surrounded by other devotees engaged in the service of Krishna. In addition to the primary goal of establishing care facilities, the Vedic Care Charitable Trust runs a website (www.vediccare.org) that is useful to those needing service and those who want to help. Plans and success stories can be found there, as well as a library of Krishna conscious literature and the VCC journal, The Vedic Times. The outreach care programs allow volunteers to visit shut-ins and those in care facilities to share shastra readings, kirtana, and prasadam. In this way those like Manisha who need association and care before the VCC facilities are established can still have access to it. Many devotees have endorsed and applauded the efforts of the VCC. GBC member Guru Prasada Swami said, "I fully and wholly endorse this most wonderful effort to serve Vaishnavas. In the beginning of the Srimad-Bhagavatam it states unequivocally that service to the Vaishnavas is the key to performing bhakti." GBC executive committee member Yadunandana Swami concurs. "Service to the Vaishnavas is the highest religious principle, the offering that pleases the Lord the most." Ambarisha Dasa many have best explained the need for what the VCC offers: "Many devotees from around the world have sacrificed their lives and well-being to give the mercy of Srila Prabhupada and Sri Sri Gaura-Nitai to people everywhere. There must be a place for them at the end of life where they can be cared for in a Krishna conscious environment." Prabhupada taught the principle dasa anudasa: "[I am] the servant of the servant." The Vedic Care Charitable Trust is set up to be the servant of Krishna's servants. Its work is a crucial form of devotional service. It will continue, and the more devotees who join its cause, the more work can be accomplished. Readers interested in learning more or getting involved may visit the VCC website: www.vediccare.org.